The Wolters Kluwer Community will make it easier than even before for you to find the CCH iFirm answers you need and to connect with our Support team. We’re excited to officially launch the CCH iFirm Integration Partners program in 2017 to grow our network of API integration. Within CCH iFirm Tax you can now send a reminder email to your clients about IRD tax payments that are due. A specific email template has been developed for this, however the template can be customised to meet your firm’s needs. What else is new in CCH iFirm Tax? What else is new for Practice Manager? Create and use Billing Groups to create invoices to show who owes the debt to your firm for work performed. We’ve released new Practice Manager features to make the running of your practice even easier with increased functionality for job flow visibility, workflow visibility and capacity planning. During the process of emailing Statements or Invoices to clients, you now have the option to print any statements where a client doesn’t have an email address, without having to go through the list yourself. Read More about invoices here and statements here. Additional reporting options, including Billable Time by Client and Billable Time by Period. If you are uploading multiple documents, you can now send these documents in a single email to your clients instead of having to send individual emails for each document. This new feature allows you to further streamline and consolidate your client communications. What else is new in Client Portal? When clients sign documents in Client Portal, you have the ability to tag multiple sections of the document where their signature, initials or date stamp are required. The tags also take them to the specific locations for signing. This new feature makes signing documents in Client Portal more efficient and improves the user experience for your clients. 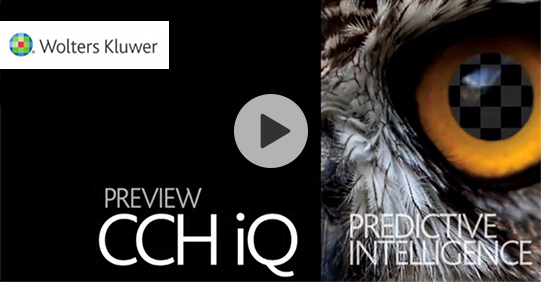 CCH iQ is the predictive intelligence tool that combines CCH iFirm software and CCH iKnow content to drive actionable outcomes by leveraging your client data. There are already multiple CCH iQ events within the CCH iFirm platform for you to start using as business development opportunities and to engage with your clients. CCH iFirm’s Client Accounting module now allows you to produce financial reports which show various segments such as departments, divisions, branches or cost centres. You now have the option to round financial reports to the nearest cents in Client Accounting.